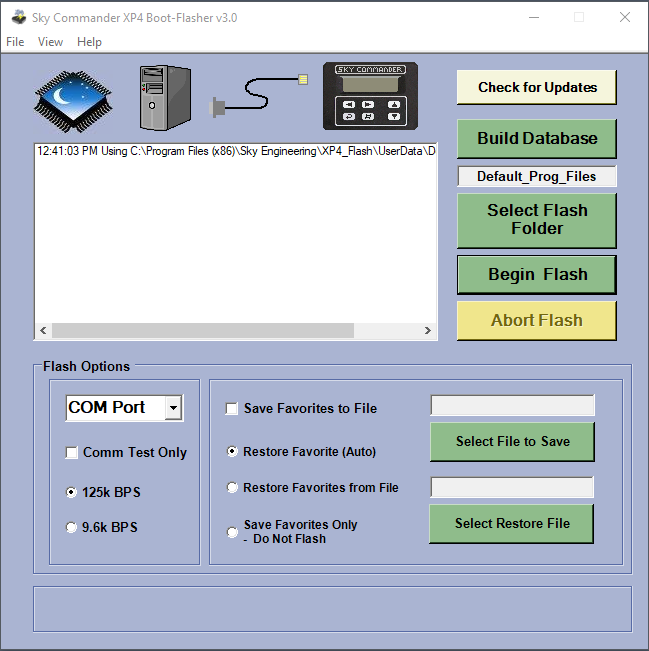 In this demo you will be shown the basic procedure for Flash Programming the Sky Commander. For an understanding of all programming options and capabilities, please read the detailed HELP file. It is available under the "Help" tab at the top of the main screen in the program . Assumptions: The Boot-Flasher software v3.0 has been installed on your PC along with Microsoft DotNet Framework 4.x. Step1 Click on the icon (should be on your desktop) to start the Boot-Flasher. The main screen appears. Click on [Check for Updates] button to make sure you are using the latest updates.